1. We got a new roof this week! We had that big storm in March and every since then people all around town have been getting new roofs and siding. We had been on the list since April with﻿ a local company, and were so pleased to have it get done before winter weather moves in. 2. We got to choose the color for our new siding. That big storm really got us rolling for some needed home repairs. We are on another list for siding, and will have to wait another couple months to get the work done. The color we chose is a bit... boring. All the colors were. I mean, they had these really great colors, but they were thousands more and insurance wouldn't cover them so we are going with a boring color that insurance will pay for. 3. Malcolm has decided he no longer needs to sleep. At least, that's my take on it. I don't mind the night waking we can snuggle under the covers, but during the day I have to get more done than just snuggling. 4. Malcolm has been a complete beast lately. Probably due to number three. 5. Margaret is becoming a real little mommy. At least her interpretation of one. She pulls my sewing bag around saying, "I'm going to sewing." She grabs an apron and exclaims, "Everyone out! I am cooking!" She tells me that she needs "Puter time to check her mall." She will tell me what "our baby" needs at all times. "He needs to nurse. He needs to be changed. He's lonely." It's my life mirrored back to me, but in a much more interesting format. 6. Isaac finished Sound Beginnings! This is the program we use in first grade, my my little guy had a rough time with it and so we extended it into second. I am so glad that I did because by the end he had a genuine grasp of the material. 7. We are studying the Pangea in geography. Henry made a nice map of our world as the pangea. In case you are having trouble reading the caption on the map, it reads: "My Pangea. By Henry Krom. A VARE NIS. WRK OF. ART. GEOGRAPHY." My heart swells with love for that boy. 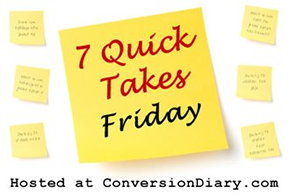 Head over to Conversion Diary hosted by Jen to read more Quick Takes. Wasn't the roof work loud? Ours was *so* loud for three days! Very cute about your little mommy. Yeah, I hear you regarding sleep, or lack thereof. Glad it's not only me. It's *so* not fun. Ahh a new roof,isn't it funny the things that make us happy as adults? You have a beautiful family! Katherine~ You know, it wasn't that loud for us. I think because our house is so tall. If I had been on the third floor trying to school the kids it probably would have been hard. Conservamom~ You are so right!